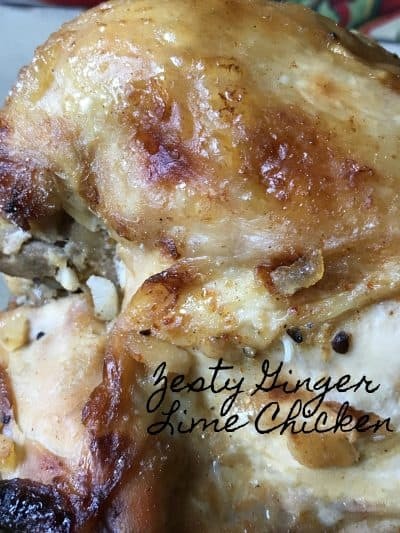 Zesty Ginger Lime Chicken Breast are super delicious and flavorful. 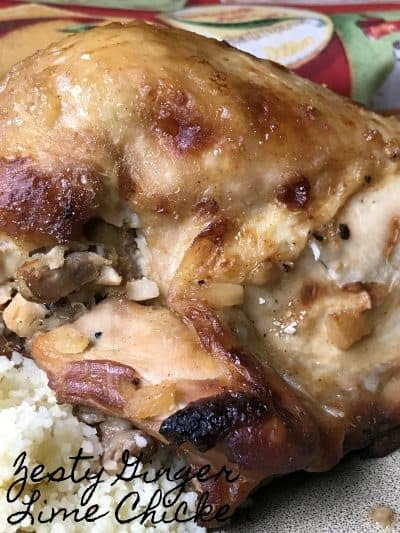 You can make this recipe with either boneless, skinless chicken breasts or with chicken breasts that have the skin on and bone in. Make these marinated chicken breasts in the oven on on the grill, the choice is up to you. 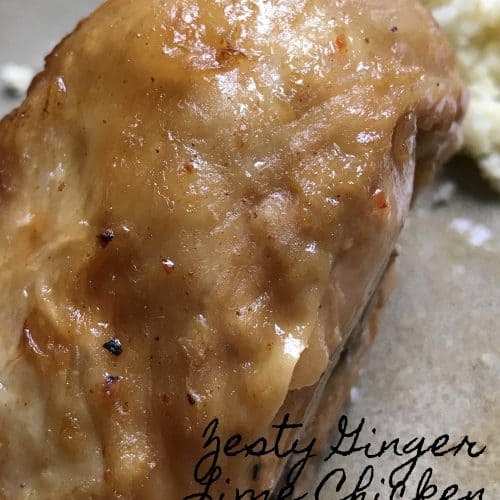 Either way you cook zesty lime ginger chicken, the secret is to allow the chicken breasts to marinade overnight for maximum flavor. One ingredient in this recipe is from Paradise Fruit Co. That ingredient is for crystallized ginger. 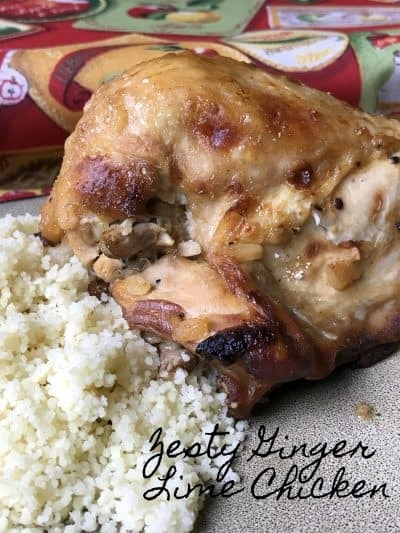 Crystallized ginger is usually used in sweet or baked goods but I decided to use it in this marinade recipe. The ginger adds a delicate sweetness and fantastic flavor. Serve grilled or baked boneless, skinless chicken breasts on a toasted roll and serve the baked or grilled bone-in chicken breasts with jasmine rice and a side of vegetables. 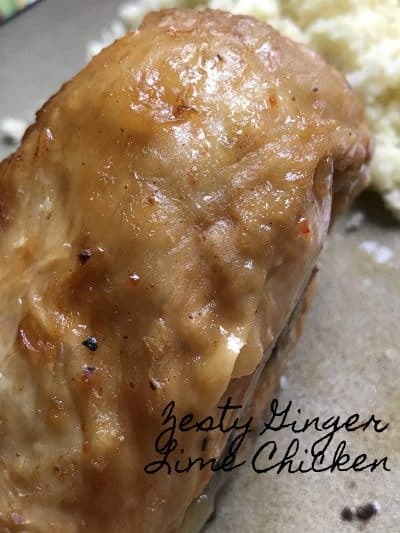 The longer you can allow the chicken breasts to remain in the marinade the better, preferably 12 hours or overnight, to allow the flavors to penetrate the chicken. This not only allows for maximum flavor but it will tenderize the meat at the same time. Cooking times will vary due to grill/oven temperatures, type of chicken used (boneless or bone-in) and marinating times. To marinade, marinate or macerate, that is the question?? The words marinate and marinade are two different words but are often used interchangeably, which they shouldn’t be. I think everyone makes this mistake, I know I have! Marinade is a seasoned liquid in which foods such as meat, fish and vegetables are soaked (marinated) in order to absorb flavor. Marinate is to soak food such as meat, fish or vegetables in a seasoned liquid mixture called a marinade. When fruits are similarly soaked, the term used is macerate. Macerate [MAS-uh-rayt] To soak a food (usually fruit) in a liquid in order to infuse it with the liquid’s flavor. A spirit such as brandy, rum or a Liqueur is usually the macerating liquid. Marinade [MEHR-ih-nayed] A seasoned liquid in which foods such as meat, fish, and vegetables are soaked (marinated) in order to absorb flavor and, in some instances, to be tenderized. Most marinades contain an acid, (lemon juice, vinegar or wine) and herbs or spices. The acid ingredients is important for tough cuts of meats because it serves as a tenderizer. Marinating should be done in glass, ceramic or stain-less steel, never aluminum. Marinate [MEHR-ih-nayt] To soak a food such as meat, fish or vegetables in a seasoned liquid mixture called a marinade. The purpose of marinating is for food to absorb the flavors of the marinade or, as in the case of tough meat, to tenderize. Because most marinades contain acid ingredients, the marinating should be done in a glass, ceramic or stainless-steel container-never aluminum. Foods should be covered and refrigerated while they’re marinating. Serve Zesty Ginger Lime Chicken Breast with a side of couscous and steamed vegetable of your choice, for a delicious, satisfying and light dinner. Chicken Breasts soak up this fantastic marinade overnight, resulting in tender, juicy chicken with great flavor. Place chicken breasts in a shallow baking dish or in a large gallon size ziplock baggie. Mix remaining ingredients and pour over the chicken breasts. Cover and refrigerate several hours or overnight. Oven Method: Preheat the oven to 375 degrees. Drain chicken breasts. Place the chicken on a baking dish. Bake for 45 minutes to 1 hour or until golden brown and cooked through. Chicken Curry, Creamy Lemon Chicken and Light Creamy Pesto Chicken are just a few of our favorite chicken recipes.